Think about your time since you joined Delta Tau Delta. Think about the friendships, the leadership opportunities, the service, and all the things you learned during your time in the Fraternity. How has Delta Tau Delta impacted your life today? Keith Steiner graduated from Allegheny College more than 40 years ago, but his passion for the fraternity is as strong as it was in his days as a student. His involvement in the fraternity has shaped his friendships, his service and his career. While a senior at Allegheny, Steiner was required to do a history thesis. He chose to study the history of the Alpha Chapter of Delta Tau Delta, which lead to a 125-page paper that combined oral history with records from the Fraternity headquarters. His thesis became required reading for new members, and his research led him to a job the Delta Tau Delta Central Office in Indiana. After working as a chapter consultant for two years, Steiner went to Ohio University to begin his MBA and served as a resident advisor for Beta Chapter at Ohio University. 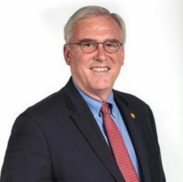 Steiner returned to Indianapolis to serve as director of program development in the Fraternity’s Central Office and served as director of chapter services from 1982 to 1985. After completing his MBA at the University of Indianapolis he joined Paine Webber (now UBS), and he has been there ever since. Steiner currently serves as the vice chairman of the Foundation Board of Directors, and is also a member of the investment committee. He’s also still actively involved in supporting the Allegheny Chapter, helping them raise over $1 million to expand and remodel their shelter, which was dedicated last September. Steiner credits Delta Tau Delta with helping him learn valuable communication skills, and exposing him to the world of advising and consulting at an early stage in his career. He’s currently a financial consultant for non-profit organizations; a direct influence of his experiences in Delta Tau Delta. Steiner’s professional life is not the only thing that has been shaped by his Delt experience. He is still close with his pledge brothers, and even after 43 years they still get together. He’s also actively passing on the torch. Undergraduate brothers will hear Keith speak this April at the Ignite Leadership Experience, where he’ll be sharing what he’s learned in his 40-plus years as a brother. The decision to become a Delt is one that reaches far beyond the college experience. Those who have truly valued there experience don’t keep it to themselves; like Keith Steiner, they actively find ways to inspire the next generation of Delt men. How can you encourage the next generation to find their spark?